BOKS Shoe Design Delivery Day! 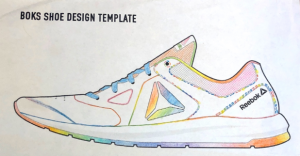 Back in July, we held our very first BOKS Shoe Design Contest. 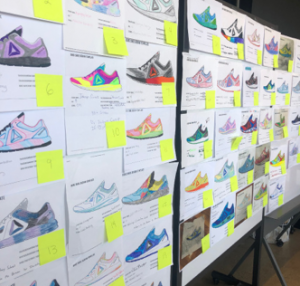 The contest challenged kids to design their very own Reebok shoe and the winner of the contest received the opportunity to bring their shoe to life. 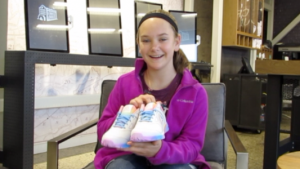 After a company-wide evaluation of thousands of submissions from across the country, Emma from the Grace Academy in Maryland, was announced our winner. Emma’s original design won over the hearts of our designers with the simple rainbow detailing and smooth transition between the different shades. At the time, Emma’s school did not have a BOKS class, but she had attended BOKS with her Aunt (Lead Trainer Sarah Spelman at Springfield Elementary) and entered the contest with her class. With a little help from our kids footwear team Emma’s shoe (pictured below) went from a drawing to a real shoe. should do BOKS before school. Fast forward to December, and we Emma’s shoes to her Aunt’s BOKS class in Springfield, MA. The BOKS kids were ecstatic to receive new shoes and put them on immediately before class. One of the kids explained how it was the first pair of new shoes they ever owned. 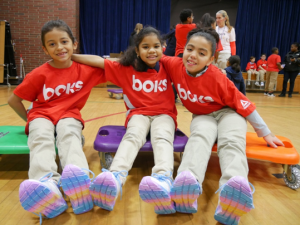 We were so happy to provide Springfield Elementary BOKS students with new shoes to motivate them to stay active! Stay tuned for the next BOKS shoe design contest and maybe you could bring brand new Reebok shoes to your BOKS class!